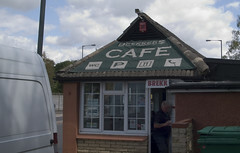 A basic roadside greasy spoon on the A23 near Coulsdon. Food is basic greasy-spoon fare — good big breakfasts. It's slightly more expensive than its neighbour, the Full Monty Cafe, but has a wider range of food on offer. All of it fried, of course. An anonymous commenter (June 2011) tells us that you can also have your car cleaned there while you're eating. DrHyde's verdict: Almost (but not quite) as good as the Full Monty. Accessibility: Level access to caff from road. There is a small car park. Getting here: If you're southbound on the A23, having gone through Coulsdon, it's on the left a couple of hundred yards after the Full Monty caff. If you're northbound, there's a layby on the northbound carriageway and you may then risk life and limb crossing the dual carriageway on foot. Last visited by DrHyde, June 2009. Last edited 2013-08-26 15:53:07 (version 7; diff). List all versions. Page last edited 2013-08-26 15:53:07 (version 7).